The chef and humanitarian talks about the American Dream, why Guy Fieri deserves more credit, and what he learned in Puerto Rico. 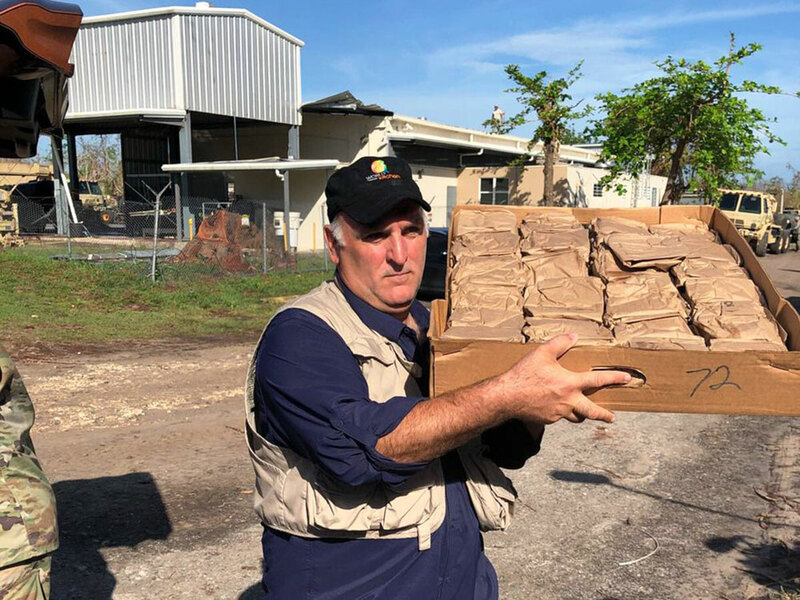 Twenty-five years ago, long before he became one of the world’s most famous and important chefs, José Andrés volunteered his time at D.C. Central Kitchen, an organization that turns recycled food into meals for the local community and gives culinary training to the unemployed. Andrés, who at 23 had opened Jaleo in Washington, D.C., would peel potatoes alongside ex-convicts and think about how lucky he had been in life. Andrés was a young Spanish immigrant who wouldn’t become a United States citizen for another two decades, but he already knew he was on the right side of the American Dream. On May 1, during a blowout event at The Wiltern in Los Angeles, Andrés will continue to show the gratitude he has for all that America has given him and his family. So much of what he does, including the work of his World Central Kitchen hunger-relief nonprofit, is about giving back to communities and shining a light on the power of food. The May 1 event, part of the month-long Los Angeles Times Food Bowl festival, is called Changing the World Through the Power of Food and will feature a discussion with Andrés, food critic Jonathan Gold, actress Zooey Deschanel, and others. Sous chefs from L.A. restaurants will also be on stage, preparing food that could be scaled to feed thousands of people during a disaster situation. Then Andrés and the chefs will feed the crowd. The event will benefit L.A. Kitchen, which feeds the hungry in Los Angeles and was started in 2013 with Andrés as the founding board chairman. L.A. Kitchen's founder and president, Robert Egger, and Andrés are longtime friends. In 1989, Egger was a young nightclub manager who founded D.C. Central Kitchen, where Andrés would later become chairman emeritus. That’s how all this began. World Central Kitchen and L.A. Kitchen recently teamed up to feed victims of California wildfires. This, of course, happened not long after Andrés and World Central Kitchen served more than three million meals in Puerto Rico after Hurricane Maria. World Central Kitchen, which was launched after the 2010 earthquake in Haiti, also showed up in Houston last year to feed victims of Hurricane Harvey. Andrés wants to expand his humanitarian efforts. He’s discussing future relief programs with people including food-TV stars Andrew Zimmern, Guy Fieri, and Robert Irvine. Fieri, who recently made barbecue for California wildfire victims, is somebody that Andrés sees as an important voice for the United States and what it should represent. “I was very happy and proud to join them,” Andrés says. He mentions the heroes of Operation BBQ Relief, which has fired up its grills after multiple natural disasters. Consider Puerto Rico, for example. Andrés knows he’s fortunate to have a restaurant group with the infrastructure that allows him “to disappear from his restaurants” when necessary. He’s happy his partners haven’t screamed at him about it yet. But it’s important to understand that he’s still running a huge business while trying to improve the world, one meal at a time. He’s still focused on making restaurants like Minibar in Washington D.C., é in Las Vegas, and his new Somni in Los Angeles world-class destinations. He still thinks a lot about Michelin stars and world’s-best lists. He’s competitive like that. Sometimes, he wishes all he did was run his high-end restaurants. But as much as he enjoys caviar bumps, he knows that his life can’t just be about rarefied dining. Andrés has three daughters and knows he’s part of an industry that’s built on the backs of immigrants. What Andrés dreams of is an America where the hospitality you find at great restaurants is extended to all people during their worst circumstances.